La Forge is trapped on a hostile planet with a Romulan while Picard does his best to avoid sparking an interstellar war. This is two Geordi-heavy episodes in a row. I love the way La Forge macgyvers metal tools using both his visor and phaser. The writers' decision to have Worf not help the Romulan--and to have the Romulan subsequently die--is ballsy writing. As Worf goes from crewmate to crewmate who try to talk him into doing what they consider right, culminating in Picard, it feels like the show is going to go a predictable route and have Worf decide to help, out of some sense of moral obligation. However, going against that expectation makes more sense from a character standpoint and reveals a side of Worf we haven't seen much of. Without much fanfare, the show has introduced moral ambiguity. I don't have much to say about it, but I do enjoy this episode. It's extremely straight-forward. It is nonetheless poignant, however, because it meditates on pretty standard Star Trek themes in inventive ways. This episode is notable for how it helps evolve the Romulans. 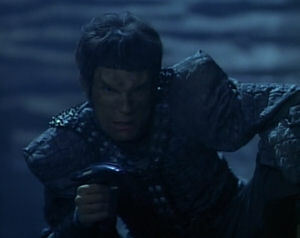 All three Romulan characters show us a different side of the Romulan psyche, and it's revealing for how Romulans will be treated in future episodes. Besides, any episode with Tamalak and Picard facing off is a good episode.